During the World War II years he conducted an all-string orchestra for a weekly show from Detroit sponsored by beer manufacturer Stroh’s. The show was broadcast in the Mid-West (Stroh’s was not sold in the Eastern states at the time). Singers included Margaret Daum and baritone Thomas L. Thomas. That’s exactly what we have here, including Margaret Daum and Thomas L. Thomas. Unfortunately this show is not complete. My disc is marked #2 of 2, and I don’t seem to have #1. It also ends abruptly during an awesome commercial for Stroh’s Bohemian Beer. I do have quite a few other recordings of “Gus Haenschen’s Rehearsal” (15, I think), many of which are complete—and some of which I’m sure will have that great commercial in its entirety. 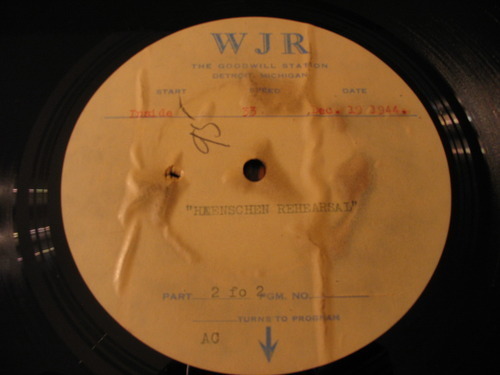 This program includes “I’m Making Believe,” “Tango of Roses” (in a rumba arrangement), and “White Christmas.” The first piece on the record is not credited during the program, but my grandpa’s index cards include a song called “Wang Wang Blues.” I’m guessing that’s what the first piece is. One thing that makes me chuckle every time I hear this is the enthusiastic applause of the studio audience… which sounds like about three people. If you’re using a screen reader, click here to go to my BandCamp site for a Flash-free download.